Our S900A Hawaiian shaved ice machine review will provide you with all the information you need on the item including a brief product description, a rundown on its various features, user reviews as well as pros and cons lists. If you prefer your ice shaved rather than in the more traditional cube format, a Hawaiian shaved ice machine might be just what you need. These ice machines provide you with a way to get very thin shards of ice without needing to do any fine chopping or grading. They can also help you make great margaritas or snow cones and are suitable for your home or office. 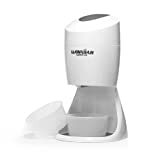 The S900A Hawaiian Shaved Ice machine comes in a white plastic mold that is both lightweight and durable. It is 14 inches high, 6.5 inches wide, and 8 inches in depth. The entire package includes a motor unit, an ice crusher cup, two molds, one non-slip mat, and a support base. Although you may need to put some of these parts together before you start the machine for the first time, they form a single unit that should function consistently after the initial installation. It weighs approximately two pounds. Recommended for: This small machine is a great choice for anyone who needs to shave some of the cost off their purchase and shave some ice for desserts at the same time. Although the motor is relatively powerful, this is a light-duty machine at its core. We recommend the S900A for individuals or small parties at home or office. Because it performs best when making a few cones or margarita ice packs at a time, we do not recommend this product for heavy or commercial use. It has an ETL certificate. You can use it for two-minute operating cycles between breaks. It makes approximately 2.5 small cups of shaved ice from a single block. You may need to thaw the ice for five minutes before shaving it. This machine works well for individuals or small groups. Once you have put your S900A model together, you can begin shaving ice in just a few short steps. Note that it does take some practice to balance the pressure you use on the ice with the sharpness of the machine’s blades. You may wish to chill anything that will make contact with the ice. Chilling any bowls you use to catch the ice shavings may help to prevent the first layer of ice from melting too quickly. Pressing the button will start the machine’s motor. Keep in mind that the amount of pressure you put on the button determines how fine the finished product will be once you’re done. We recommend pressing the button lightly with both thumbs to maintain fine control over the shaving process. Many users remark upon the quality of the shaved ice they get when they use the S900A Hawaiian Shaved Ice machine. It seems to be especially effective at creating fluffy ice that many users describe as perfect for snow cones. While pre-made syrups work well with this product, some users have had great success with homemade syrups. Users seem to like the fact that the S900A Hawaiian Shaved Ice machine will make shaved ice that is not at all crunchy. In rare cases, some users did report that their S900A Hawaiian Shaved Ice machine arrived damaged. However, they also stated that the manufacturer replaced the defective item with a working one in short order. Some users do think the noise when the machine is operating can be a bit excessive. Moreover, others find that using the machine for more than a few minutes can cause it to overheat. We recommend letting it cool down after every few snow cones. This list contains the main features of the S900A Hawaiian Shaved Ice machine that we feel really make it stand out from similar products in its category. It has an attractive design that makes it a great addition to your kitchen space, and it looks great sitting on the counter. You can use the S900A Hawaiian Shaved Ice machine to create soft ice that has a fluffy consistency perfect for making snow cones. The manufacturer backs up this product with a good warranty. It is compatible with a variety of snow cone syrups. The S900A Hawaiian Shaved Ice machine excels at light home use and is perfect for small parties. You can carry or transport the S900A Hawaiian Shaved Ice machine easily. It has an ETL rating for safety standards. No S900A Hawaiian Shaved Ice machine review would be complete without discussing a few things that we think the manufacturer might improve. We’ll list a few things the company could improve below. As many users suggested in their reviews, the S900A Hawaiian Shaved Ice machine can be noisy. We do not think it is excessively noisy nor that it makes substantially more noise than most other shavers. Nonetheless, a quieter version of the S900A Hawaiian Shaved Ice machine would be a plus. The S900A Hawaiian Shaved Ice machine is relatively powerful. On the other hand, we do not recommend that you use it to shave ice for more than a few minutes at a time. We noticed that it could sometimes take some time to shave ice if we used cubes or crushed ice. It would be great if the machine could do it faster. Users’ favorite ice makers for home bar. An in-depth look at Yeti Roadie 20 Cooler. Our full review of the S900A Hawaiian Shaved Ice machine should tell you everything you need to know to make an informed buying decision. We think it is one of the best light-duty products in its category and the perfect way to make cones or margaritas for a small party. Please share your thoughts on the S900A Hawaiian Shaved Ice machine with us in the section below.